LIVVI’S CAFE OPENS: On Friday 11 July 2014, Touched by Olivia opened it’s first social enterprise cafe at Livvi’s Place Five Dock, located on Henley Marine Drive. With major sponsor Stockland and City of Canada Bay on hand to show their support, hundreds of people lined up for coffee, cakes and paninis. Here is some of the media. A POP-UP cafe in Timbrell Park has been specifically designed to offer employment opportunities for people with a disability. The cafe, located next to Livvi’s Place (playground) in Five Dock, is the result of the hard work of Justine and John Perkins who lost their baby daughter Olivia to a rare illness at just eight months old. “It has always been a vision of ours,” Ms Perkins said. In 2009, the couple opened Livvi’s Place, a playground for children of all abilities. Sandra Casinader, whose two young children often use the playground, is delighted by the idea of the cafe. It will be a social enterprise, hiring people with additional needs. “I feel so proud and connected as I imagine a future for Kingsley in just these types of scenarios,” Ms Casinader said. Canada Bay Council have shown their support by offering 18 months rent-free. Funds raised from the cafe will go back into the Foundation with the aim of building an inclusive play space in every community. A playground to give children with a disability an opportunity to play with others now has its own cafe! 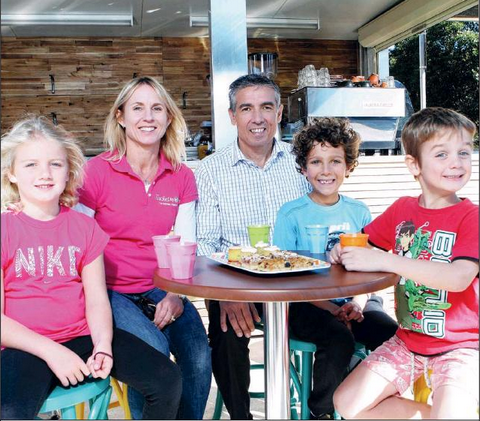 Livvi’s Place in Timbrell Park, Five Dock opened Livvi’s Cafe on Friday with profits to go towards playground equipment and facilities. It is run by the Touched by Olivia Foundation which was founded by Justine and John Perkins several years ago in memory of their baby daughter Olivia who died of a rare illness at just eight months old. John Perkins told The Weekly Times Olivia would have been thrilled to be at the Livvi’s Cafe launch. “This playground is always full with children of all ages and abilities and to see so many playing here this morning would have brought a huge smile to her face,” he said. Mr Perkins said as well as the profits going to support the playground the cafe will employ five people with a disability each year and offer barista training. “It will be open from 7.30am until 5pm and just stopping for a coffee will go a long way to help our playground,” he said. It was officially opened by Drummoyne MP John Sidoti and City of Canada Bay Mayor Clr Angelo Tsirekas. “We are thrilled to partner with the Touched by Olivia Foundation to deliver Livvi’s Cafe,” Mayor Tsirekas said. “The City of Canada Bay has provided the space rent-free for 18 months and also assisted with the set-up of the Cafe. John Perkins paid tribute to its major sponsors. “Livvi’s Cafe would not be happening without the generous support of our partners, the City of Canada Bay and Stockland,” he said. The opening of a new pop-up café at Timbrell Park, Five Dock, will offer employment opportunities for people with a disability, as well as raising money for the Touched by Olivia Foundation, says City of Canada Bay Mayor Angelo Tsirekas. “Livvi’s Café will open at Livvi’s Place, the flagship playground for the Touched by Olivia Foundation. The new Café will provide employment opportunities for people with a disability down the track but will also be a great benefit to users of the playground,” he said. Justine Perkins, Founder of Touched by Olivia, said Livvi’s Café aimed to be a sustainable model of funding, providing programs and employment opportunities for people with a disability in the community. “Our goal in the next few months is to have the Café up and running and be in a position to employ people in our community with a disability to work alongside the operators of the Café,” she said. The Touched by Olivia Foundation was founded by Justine and John Perkins after they tragically lost their baby daughter Olivia to a rare illness when she was just eight months old. Their life as they knew it came crashing down with immense sadness. Following this devastating event, John and Justine devoted themselves to positively enhancing the lives of children and their families. The Touched by Olivia Foundation was a step towards realising the dream that has become Olivia’s legacy. 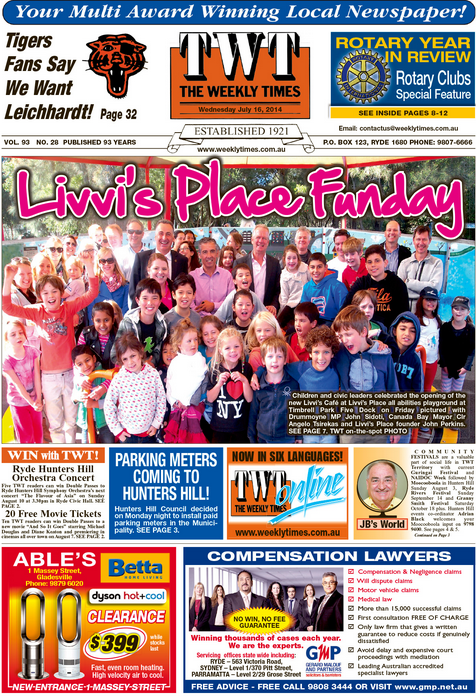 Livvi’s Place, located in Timbrell Park at Five Dock, was launched in 2009 and is the flagship inclusive playspace of the Touched by Olivia Foundation. It was designed in consultation with experts in the areas of play, disability, and landscaping, along with the local community. Centrally located in Five Dock, Livvi’s Place was built for children with all forms of disability and from all parts of Sydney. The playground’s unique design and equipment addresses the needs of children with various forms of disability including mobility, vision and hearing impairments, as well as spectrum disorders such as autism. “Livvi’s Place aims to dramatically reduce the barriers experienced by children with special needs and their families, helping to give them a level playing field for life,” Justine said. Livvi’s Café was launched on Friday 11 July, 2014 by City of Canada Bay Mayor Angelo Tsirekas, Justine and John Perkins from Touched by Olivia and Lauren Cassar from Stockland.